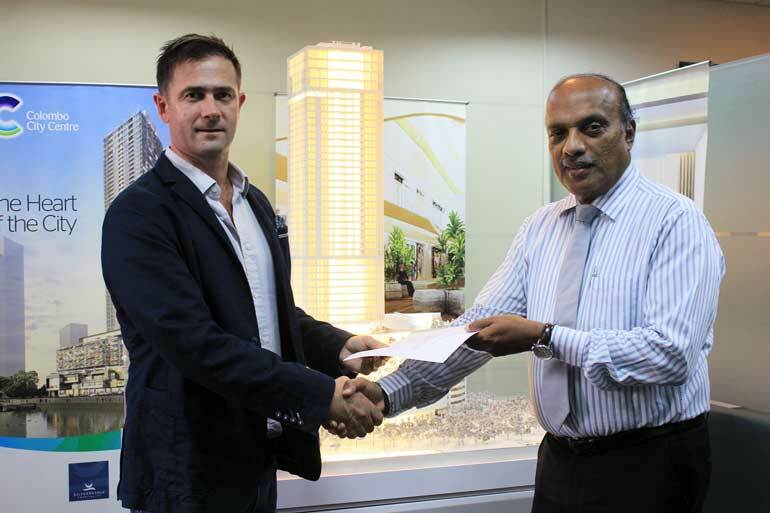 From left: Lucas Shannon – Senior Vice President Development, Property, SilverNeedle Hospitality, Singapore handing over the agreement to Major Ranjith Gunatilleke - Managing Director, Sanken Construction Ltd.
A $ 100 million contract has been awarded to Sanken Construction Ltd. for the much anticipated construction of the Colombo City Centre, a joint venture project between Abans Group and SilverNeedle Hospitality of Singapore. “After a lengthy and rigorous evaluation process with numerous reputable bidders, we are delighted to award this project to Sanken Construction. 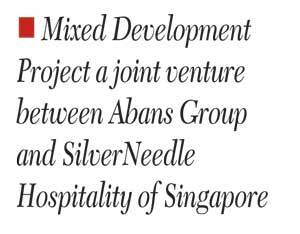 We look forward to working with them on this signature project that will redefine lifestyle retail, hotel and residential living in Sri Lanka and be the iconic landmark in the heart of Colombo city,” stated Anand Nadathur, Chairman of the Joint Venture and CEO of SilverNeedle Hospitality. Sanken Construction is one of the most experienced and credible construction companies in Sri Lanka with building experience of more than 30 years spanning work in Sri Lanka, the Maldives, Africa, India and Australia. Sanken Construction’s completed projects in Sri Lanka include the showroom and service building of Toyota Lanka, The House of Fashion, HNB Towers and the headquarters of Hatton National Bank to name a few. The Colombo City Centre is a 47-storey mixed-use lifestyle centre at the heart of Colombo. The first four levels of the centre will consist of 210,000 square feet of retail mall complemented with an eclectic mix of local and international brand shopping options and a modern take on community dining. The 196-room Next Hotel, the flagship brand of SilverNeedle Hospitality, will occupy floors 9-20. ‘Designed to make your time count’, Next hotels empower guests with choice, flexibility and control while combining space, technology and service. “We are very excited and proud to be associated with the Colombo City Centre project and are fully committed to meeting the completion date of mid-2018 and to building the highest quality construction for this iconic landmark,” said Sanken Construction Chairman Mahen Weerasekera.